Spine fusion back surgery is a procedure that is performed to link or fuse two or more vertebrae together. When a patients suffers from a back disorder where the vertebrae has problem in the disc space, doctors usually recommend spine fusion surgery so that the motion in that part of the spine can be eliminated and the. With the help of spine fusion back surgery, the surgeon links the vertebrae together to help the patient get rid of his problem. 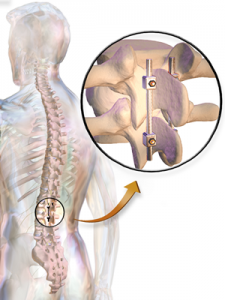 How Does Spine Fusion Surgery Work? During this type of spine surgery doctors generally try to stimulate growth of bone between vertebrae. That means that during spine fusion back surgery doctors can piece of metal between vertebrae so as to hold them together. This type of spinal instrumentation is quite common in a fusion surgery and this type of instrumentation is available in various types. Your doctor will recommend and go for a particular type of spinal instrumentation depending upon the back problem being treated. The number of vertebrae that are being fused together as well as age and health of the patient are factors that are usually taken into account before finalizing a spinal instrumentation. Failure in the fusion of vertebrae segments: This is a major problem that can occur in a spine fusion surgery. It is often difficult to get a new bone to grow, although it is true that there are stimulants that may help in bone growth but in few cases it might not happen and the spine surgery may fail. Area around the spine fusion (vertebrae and disc) develop problem: This possible drawback does not occur immediately after the surgery, it develops overtime and can appear full force after a few years.